In order to compliment Precision Waterjet Cutting of close tolerance parts we have our own in house Flat Bed Linishing and Brushing machine. This allows us to be a ‘one stop shop’ and supply fully deburred and finished components to customers, where required. 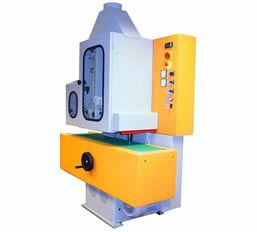 This machine provides a combination of both linishing and brushing to produce a satin grained finish on one (DP1) or two (DP2) sides for components up to 300mm wide. Most metals apart from Aluminium are suitable to be processed this way. We regularly produce dull polished grained finishes on stainless steel, copper and brass. This often eliminates the need to buy in small costly amounts of pre-grained sheets and plate.